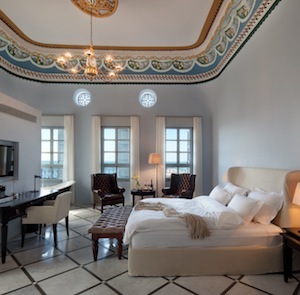 If the walls of the Efendi Hotel could talk, you might never get any sleep. 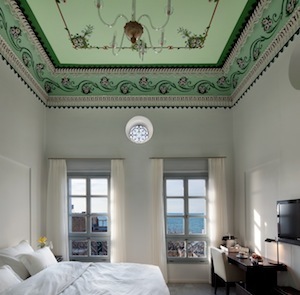 The hotel is located in the ancient Israeli port city of Acre, at the northern end of the Bay of Haifa, a place whose recorded history goes back to the Bronze Age. So by local standards, perhaps the Efendi, which contains remnants of structures dating as far back as the 6th century, is merely middle aged. After an eight-year renovation, the two buildings that now make up the twelve-room hotel are looking better than ever, a painstakingly detailed homage to the place’s remarkable architectural provenance. Not that it’s a museum; it’s a hotel with all the Egyptian cotton linens, goose down pillows and blankets, towel warmers and oversized showers that make a very old building a pleasant place to stay. 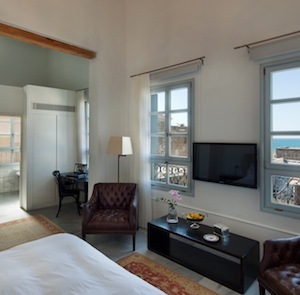 The better rooms add views of the Old City, while some have decorative arched windows overlooking the Galilean hills or views of the sea and freestanding claw-footed bathtubs. While the emphasis in the accommodations is on comfort, it’s in the public spaces that the hotel’s history comes to the fore. You can spend your spa time in a restored, 400-year-old Turkish bath, and breakfast takes place at an enormous knight’s table in a room dating from the early Ottoman Empire. The highlight, however, has to be the cellar, with original arches built by Crusaders in the 12th century. Perhaps most importantly, the tapas and wine are outstanding. The man behind the Efendi is Uri Jeremias of Uri Buri, one of the most acclaimed restaurants in Israel. His specialty: decidedly contemporary preparations of extremely fresh seafood. For all the place’s history, it’s hard to imagine the food here has ever been better. 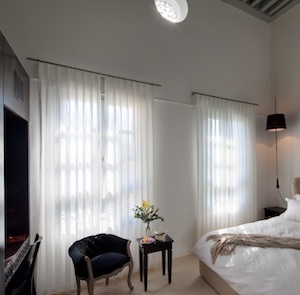 How to get there: The Efendi Hotel is located approximately 30 – 40 by car from Haifa International Airport, and approximately 90 minutes by car from Tel Aviv Ben Gurion Airport.